Did God become a man? Did the Word, a member of the Godhead, actually become the flesh-and-blood human Jesus? What does the Bible reveal about the Son of Man? In the 2,000 years since the birth of Jesus, there has been considerable debate among theologians as to who or what Jesus really was. Some have believed that Jesus was simply a man, a human being—a prophet just like Isaiah, Jeremiah, Ezekiel or any of the prophets of old. Others, like the Docetae, believed that Jesus, as God, only appeared human—that a member of the Godhead did not actually become a human being. John wrote clearly in John 1:1, “In the beginning was the Word, and the Word was with God, and the Word was God” (emphasis added throughout). John describes the Word as being with God. The Word was with that member of the Godhead often described in the Old Testament as God Most High. John also clearly said the Word was God. The apostles understood that the Word was clearly a member of the Godhead—that He existed on the God-plane level of life. John then wrote something that is quite profound: “And the Word became flesh and dwelt among us, and we beheld His glory, the glory of the only begotten of the Father, full of grace and truth” (John 1:14). The Word was God, and the Word became flesh. The Word became the man Jesus Christ, who called Himself the Son of Man more than 80 times in the Gospels. However, a heretical belief arose in the first century that Jesus Christ wasn’t a member of the Godhead who had actually come in the flesh. The apostle John in his first letter warned the early Christians about such a heretical teaching. “Beloved, do not believe every spirit, but test the spirits, whether they are of God; because many false prophets have gone out into the world. By this you know the Spirit of God: Every spirit that confesses that Jesus Christ has come in the flesh is of God, and every spirit that does not confess that Jesus Christ has come in the flesh is not of God. And this is the spirit of the Antichrist, which you have heard was coming, and is now already in the world” (1 John 4:1-3). When a member of the Godhead became a human being, obviously something had to change. When the Word became flesh, it is clear that what changed was His spiritual, immortal existence on the God-plane level of life. The Word would no longer be a spirit being―composed of immortal spirit. The Word would become a human being―composed of mortal flesh―subject to death. Paul described what happened in Philippians 2:5-8: “Have this mind among yourselves, which is yours in Christ Jesus, who, though he was in the form of God, did not count equality with God a thing to be grasped, but emptied himself, taking the form of a servant, being born in the likeness of men. And being found in human form he humbled himself and became obedient unto death” (Revised Standard Version). The Word was God. He was in the form of God―on the God-plane level of life. But when the Word was conceived in Mary’s womb, He became flesh. He emptied Himself of that immortal existence and became fully human—the Son of Man. The Word was God. He was in the form of God―on the God-plane level of life. But when the Word was conceived in Mary’s womb, He became flesh. He emptied Himself of that immortal existence and became fully human—the Son of Man. The Word stayed the same. The Word was God, and the Word became flesh. The substance of the Word’s existence changed when the Word that was God became flesh. This is what the Bible says. The Word when He became flesh became the man Jesus. Not all of the details of what God the Father did to have the Word born of Mary as His Son are given in the Bible. The Word was supernaturally conceived in Mary. The child that was born was named Jesus. The Word became flesh―the Son of Man. Did Jesus have all of the memories and knowledge of the Word? We do not know, for the Bible does not fully explain this. What we do clearly know is that at least by age 12 Jesus knew who He was, for He said to His physical parents, “Why did you seek Me? Did you not know that I must be about My Father’s business?” (Luke 2:49). Jesus was referring to His Father God. John’s Gospel records many other words of Jesus and others attesting to the fact that Jesus had existed before His human birth and that He had come from heaven above. John the Baptist, who was born before Jesus said, “This was He of whom I said, ‘He who comes after me is preferred before me, for He was before me’” (John 1:15). The apostle John wrote, “No one has ascended to heaven but He who came down from heaven, that is, the Son of Man who is in heaven” (John 3:13). Jesus had returned to heaven by the time John was writing his Gospel. This is a parenthetical statement that John added when writing his narrative of Jesus’ life decades after Jesus’ ascension. In the same chapter John the Baptist speaks about Jesus: “He who comes from above is above all; he who is of the earth is earthly and speaks of the earth. He who comes from heaven is above all” (verse 31). Again, speaking of Himself, Jesus said, “For the bread of God is He who comes down from heaven and gives life to the world. 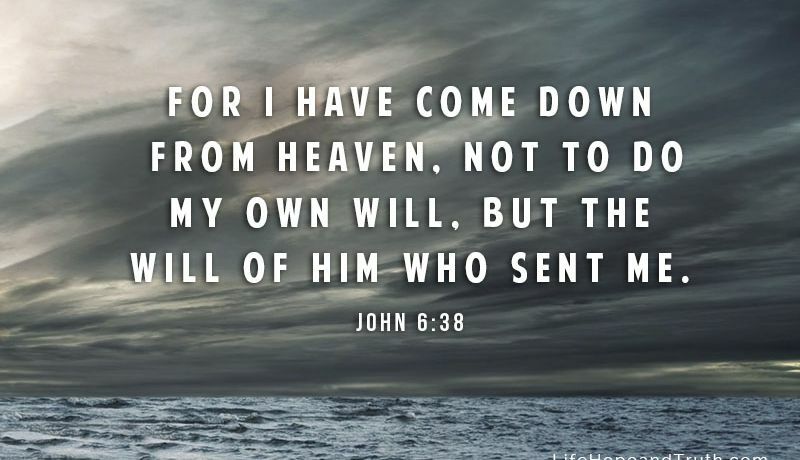 … For I have come down from heaven, not to do My own will, but the will of Him who sent Me” (John 6:33, 38). Jesus, in addressing the Pharisees said, “You are from beneath; I am from above. You are of this world; I am not of this world” (John 8:23). Jesus spoke further to the Jews, “If God were your Father, you would love Me, for I proceeded forth and came from God; nor have I come of Myself, but He sent Me” (John 8:42). A little later Jesus made a very powerful statement as to who He was: “Then the Jews said to Him, ‘You are not yet fifty years old, and have You seen Abraham?’ Jesus said to them, ‘Most assuredly, I say to you, before Abraham was, I AM’” (John 8:57-58). Most recognize that I AM is a clear reference to the name God called Himself when Moses asked for God’s name at the burning bush (Exodus 3:13-14). There are many other such references. However, this is sufficient to show that Jesus knew who He was. For a member of the Godhead to become a human being is an incredible truth upon which to reflect and meditate. The Word who was God became the Son of Man, Jesus the Christ―the Anointed―the Messiah. Why? As Paul wrote in Philippians 2:5-8, one awesome purpose for the Word becoming flesh was to become the perfect sacrifice for sin―to die to make forgiveness of our sins possible so that we might have access to life eternal. As John the Baptist said when Jesus came to him, “Behold! The Lamb of God who takes away the sin of the world!” (John 1:29). He also came to equip Himself to be an understanding High Priest―our Intercessor―who knows what it is like to be human when we come before God in prayer in our times of need (Hebrews 4:14-16). Further, He came to set the example for us of how we should live in order to inherit life in God’s Kingdom (1 John 2:5-6). God became a man―the Son of Man―because God has an incredible plan for humankind.